If you’re after a medical text, you’re in the wrong place. This page is about my novels. 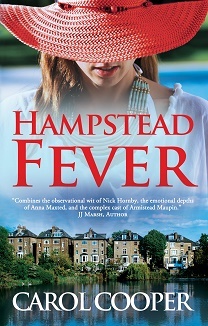 My latest book Hampstead Fever follows the lives of six people as they grapple with soaring temperatures and sizzling emotions. From March 30, you’ll find the paperback in WH Smith bookshops in rail stations and airports, on a special buy one, get one free promotion. Here’s a bit more about the book. Stressed doctor Geoff finds solace in the arms of a mercurial actress. Journalist Harriet’s long-term relationship hits the buffers, leaving serious questions to answer. Meanwhile single mother of four Karen lacks the appetite for a suitable relationship. Any guesses what she opts for instead? My fiction ride all started with my debut novel One Night at the Jacaranda. It’s about a group of thirty-somethings looking for love. People were kind enough to buy the book and say lovely things about it, so I wrote another novel. You can find One Night at the Jacaranda here, among other places.